Clever Trevor has designed a fantastic working musician's tool that's tonally versatile, gig-tough and realistically priced. Not the most original-looking instrument. You can't accuse Trevor Wilkinson of resting on his laurels. In fact, the bloke behind Italia and Vintage guitars, not to mention Wilkinson hardware, would probably have his laurels routed out for an extra pickup if it was possible. "The Elise is a tone monster with a tasty side-order of sustain that's obvious even before you plug it in. " Tireless Trev's latest project is the Fret-King Black Label Series. Combining his own knowledge with that of experienced session and gigging guitarists, Trev reckons he's come up with a bunch of guitars that punch well above their weight in performance and tone at a price that most working musicians can afford. The semi-acoustic Elise is the first of these contenders. Let's be honest. Trevor hasn't started with a blank drawing board with the Elise. The body is an obvious nod to the Gibson ES-335, albeit with a PRS-style scoop on the treble side cutaway, and the pleasantly plump mahogany neck's 'bat-wing' headstock is an angular throwback to Epiphone solid bodies of the 60s like the Olympic, Coronet and Wilshire. But before you peg this guitar as a rip-off there's something you need to know. Most semi-acoustic guitars are built from laminated sheets of wood that are steam-pressed into shape. That's true of entry-level and mid-range guitars and quite a few expensive US and Japanese-built models. The Elise is different. Its body is a slab of solid mahogany that's shaped then routed out with sound chambers. A solid maple cap is glued to the chambered mahogany chassis then carved to form the gently arched top. So, building a guitar like the Elise is time consuming and less cost-effective than the traditional steamed laminate method. That's not to say that Trev is showing off; the reward for all this labour-intensive chiselling should be great tone. As it happens, the Elise is a tone monster with a tasty side-order of sustain that's obvious even before you plug it in. It's tonally versatile, too. The aptly named Vari-Coil control is a variable coil-tap that sweeps the great-sounding Wilkinson pickups between humbucking and singlecoil modes. The mid-point on the knob dials in a fat P90-a-like tone that gives off a thrilling snarl when you expose the bridge pickup to some overdrive. Turning the control down a notch, the singlecoil settings aren't quite glassy enough to pass for a Strat but they pump out some convincing Telecaster impressions that are a damn good substitute. £749 gets you the Elise, a deluxe padded gigbag, and Trev's best wishes. 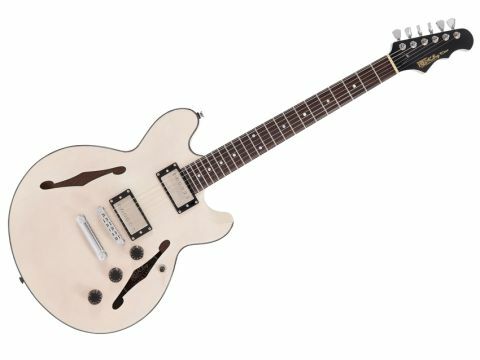 While his new guitar faces stiff competition from the likes of the Schecter TSH‑1 (£539), the Elise has the tone, playability and build quality to hold its own.